The Masterpiece Cakeshop decision was not even close in terms of votes (7-2, with Sotomayor and Ginsburg naturally voting in favor of oppression), nor was it a “narrow” ruling on the merits. Instead, it was a ringing endorsement of the idea that sniveling leftist bureaucrats can’t target religious folk for hassles just because the dissenters refuse to bend a knee to the secular idols du jour. This was not about gay marriage – conservatives are no longer monolithic on the issue (I got grief on some site for congratulating Townhall’s Guy Benson on his recent engagement). This was about the right to dissent, to think differently even if you or I or (usually) the liberal elite don’t agree. And this ruling should not be shocking, but it still sort of was. After all, until recently the tide was with those liberal elitists whose goal was to force the religious and the patriotic to their knees on every cultural issue. First, they came for the cake bakers, then they came for us. But the militant Normals changed everything when they elected Donald Trump. Do you think we’d be reading about a win for religious liberty if whatever robed pinko Felonia Milhous von Pantsuit would have appointed had taken the bench? No way – Kagan and Breyer would have joined the other three in holding that somehow that the whole freedom of religion thing doesn’t apply if liberals disapprove and off we’d go, taking another perilous step toward the nightmare of national divorce and potential conflict. So, this was good news. Well, not for the Never Trump cruise crew, who look even more ridiculous than ever. Hey Fredocons – I don’t hear you taunting us with “But Gorsuch!” much anymore. But then, I don’t watch Morning Joe or read the New York Times op-ed page. I also have a life. The opinion of Justice Kennedy, who I would love to see retire and spend more time with his family, nevertheless wrote a powerful rebuke to bigoted bureaucrats who never even bothered to hide their anti-religious zealotry when persecuting a guy for refusing to submit and acknowledge their supremacy. Their prejudice was stunning, not least for its shamelessness – these moral illiterates made no effort to hide their seething contempt for believers. And guess what? That’s not okay. You don’t get to persecute religious people in America. I know, what a drag, huh? Pretty soon lots of people are going to start openly believing things liberals don’t like. It’ll be chaos! In the aftermath, the liberal media was full of commentators expressing the hope that despite the ruling, there might be loopholes in the opinion that would allow discrimination against the faithful. Fingers crossed! Have you noticed how liberals are always nattering about exceptions to rights? They never recognize the basic rule that there’s no “abridging the freedom of speech;” instead, there’s always a reason why some particular speech is totally okay to ban. The Heller decision never gets cited for its basic holding – yeah, you have a right to keep and bear arms – but instead all the liberals ever want to talk about are the purported exceptions (which they do not understand). Here, their hope is that maybe this kind of onerous arm-twisting can be cool with the Constitution if the people demanding it are a bit circumspect about expressing their contempt for religious people. That is, if they hide their bigotry well enough, they can get away with it. Except bigotry underlies the entire idea of forcing someone you know is religiously opposed to do something, especially when there are a dozen other cake shops that can satisfy all your angel food needs. There is no confluence of facts that can obscure the basic truth – activist liberals want to force dissenting Christians to bake cakes because they want to show those Jesusfolk who is boss. The whole “Bake my cake!” thing is inherently bigoted. There is simply no other explanation for what the activists seek to do, and why they reject all reasonable accommodations and alternatives, other than animus for religious objectors. This is only the first case. 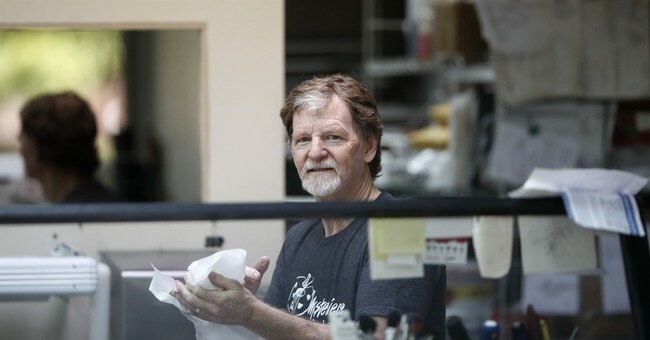 There are more decisions to follow, and you can count on reactionary liberal judges to try to contort Masterpiece Cakeshop into something unrecognizable. But that will take some doing. Donald Trump has already appointed an eighth of the circuit court bench. Thanks in part to Mitch McConnell canceling the summer recess, Trump will soon have appointed a quarter of the judges. These are conservatives who actually believe the Constitution means what is written, not what the consensus in the Manhattan/Washington axis decides. So, this was a win, and not a narrow one. The government can’t target the religious because it hates them, and you can tell from the agonized howling of the liberals that they know this is a huge deal.